Apparently not quite the deal I thought it was. But still a no brainer vs a Glock, etc striker options. Salad days, sir, salad days, get em while they're hot. Wow, with night sights. That is crazy. Weren't they the ones who recently had the P09 for like $399? Too bad buying presents has me low on gun funds. 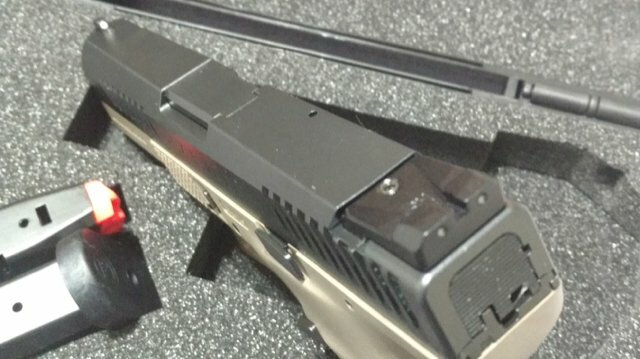 Was driving by Tombstone Tactical the afternoon and drove home with a CZ p10c, 2018, trig. night sights, front sight outlined in white, metal guide rod, ambi mag release, $379 includes shipping. There are some front sights outlined in orange and I would have liked that: Oh well. Tried several guns and either CZ has fixed the "stiff" mag release, I got lucky on all 3, or some people need hand strengthening exercises. Besides the excellent price I got this version so it would have ambi controls without changing parts out. Seems like a step backward to me on the new version. I guess people never shoot or practice offhand. armoredman: sure you don’t need a new one? I’d take that white knight off your hands to ‘make room’, and help a brother out. Very nice. I made a stop today and came home with something that looks like that but has a longer barrel and taller sights for almost the same money. I'm thinking the same here. The ambi mag release was complained about much more than it warranted. I am really tempted to pick up a third P10C while these are available with the true ambi mag release. Last spring I fell and tore two rotator cuff tendons and suddenly went from shooting right handed to shooting completely left handed. When it first happened, I could not have taken the mag release apart to swap it if my life depended on it. I was more than happy to have a true ambi pistol that let me keep carrying without any issues. Salad days for sure....that is really tempting. Yes. I asked at CZC. They are not as big or bright has Trijicon's but show up very nice in the dark. The white outline offers a nice contrast to the darker rear sights during the day. Got it all cleaned and relubed. Even got to the range and out of the car, but sadly it looks like next week before it gets used. One thing I noticed while working the action at home is that the right side IS a lot harder to depress. It's doable but when comparing the left vs right there's a big difference. Also when did CZ stop including a mag loader? Not a deal breaker, I use an Uploader, but I thought it was odd. 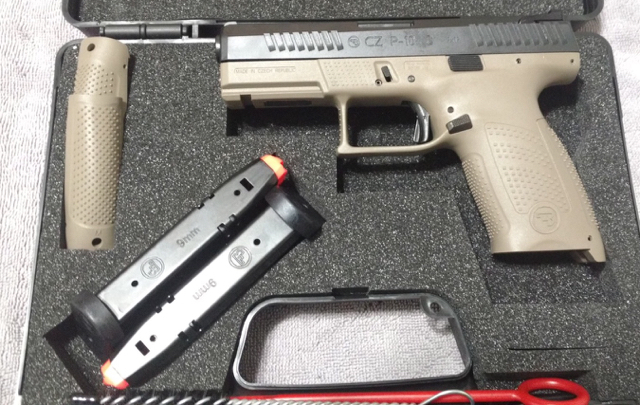 Love my CZs' but the "best" poly deal has got to be the SAR K2P 9mm. Has a full size grip (17 rnds) with a compact barrel and adjustable sights. The Da/Sa trigger is decent out of the box. A cheap spring change and buff gets it really decent. My daughter travels with one and likes that you can load the first round with the safety engaged. Bonus points it uses standard cz75b series mags. Not even sure if $270 is the best price. Thanks for the info from this thread. Ordered one from Tombstone. The Truth is the Truth even if nobody believes it !!! The point is the sights show up brightly in low light and no light conditions and are fast to acquire at that point.No one said anything about shooting blind in the dark. They also make the gun easy to spot in a dark room. Just a matter of preference not a safety issue at all.